The Electro Harmonix Pitch Fork offers something “whammy” loving guitarists have wanted for a long time: superb pitch shifting with optional expression control in a compact pedal. Yes, a few other companies have attempted this, but EHX’s Pitch Fork pulls it off like no other pedal has before. I’ve been following Electro Harmonix’s stellar pitch shifting and octave generating effects which include the EHX POG2, EHX Slammi and EHX HOG2 pedals, and the humble looking Pitch Fork represents the current pinnacle of Electro Harmonix’s ever improving pitch shifting algorithms. Aside from the various “whammy” style effects, the Pitch Fork offers momentary instant pitch shifting, detuning, drop tuning, transposing, and more. This intro is already spoiling my view of this being a supremely good pedal, possibly the best polyphonic pitch shifter pedal around. Let’s run down the features and get into our full Electro Harmonix Pitch Fork review. Transposes over a +/- three octave range. 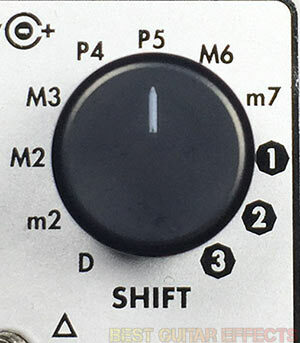 Three pitch shift modes: Up, Down, and Dual. Latch and Momentary modes affect how the footswitch and EXP intput behave. Comes with EHX 9.6DC-200mA AC Adapter, can also run off a 9 volt battery (Pitch Fork current draw: 30mA). Pitch Fork has a high quality buffered bypass. 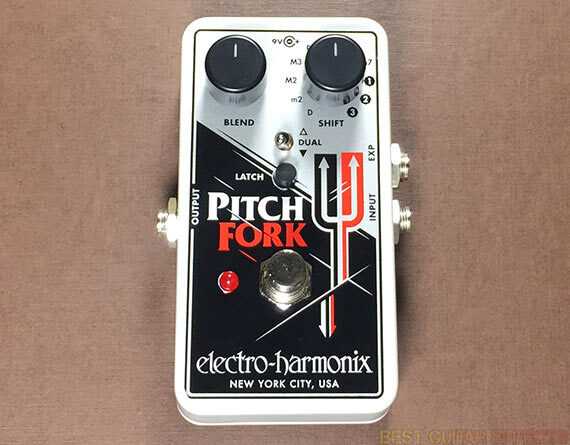 Visit Electro Harmonix for more info about the Pitch Fork. This is a pedal I’ve dreamed about Electro Harmonix making for a long time. The thought of taking EHX’s excellent pitch shifting technology and implementing it in a pedal that could be used with any expression pedal is a feature I’d happily pay their asking price for. But there’s so much more to this pedal than what you’ll notice at a glance. The broad range of pitch shifting capabilities the Pitch Fork offers and the shear quality of its polyphonic tracking and sounds make it a value that no other compact pedal on the market can compete with. First of all, let’s talk about the “whammy” style pitch shifting effects. The Pitch Fork gives you a total of 11 different pitch shift intervals which may be shifted either up, down, or both at once. You can use a fully wet signal or blend in your dry signal to harmonize with the various interval settings. That’s a lot of possibilities. The Pitch Fork’s generated notes are extremely stable, as good as the the HOG 2’s, if not better. That’s a shocking feat considering how small and inexpensive this pedal is. Even when transposing an E9 chord several steps up, the Pitch Fork retains stunning, warble-free note definition. When shifting up a full octave or more, single notes and less complex chord voicings give the best results. The Pitch Fork’s D (detune) setting gives you a chorus-like detuning effect, similar to doubling your guitar in how it expands the dimension of your sound. You can set the detune effect either up, for a slightly sharp sound, or down, for a slightly flat detuning effect. Using the D setting in Dual mode lets you apply wider detuning in both directions for a more prominent effect. I typically dislike a lot of digital pitch detuning effects, but the Pitch Fork is an exception. To get the most out of it, try setting the Blend knob left of noon for a subtle amount of detune. Also, if you’re using an expression pedal, you can set it half-way through its sweep for a controlled amount of detuning which sounds really nice. If you want more extreme detuning try the m2 setting in Dual mode for the “Deep Detune” effect. It’s pretty intense, offering a throbbing assault of dissonance when called upon. The 10 pitch shifted note intervals are as follows: m2 (minor 2nd), M2 (major 2nd), M3 (major 3rd), P4 (perfect 4th), P5 (perfect 5th), M6 (major 6th), m7 (minor 7th), 1 Oct (one octave), 2 Oct (two octaves), and 3 Oct (three octaves). Each of these intervals may be used to shift your pitch up for down for transposing and drop tune effects. There are a few note intervals missing between your original pitch and the first octave (no direct drop tuning from standard E tuning to C sharp), but this won’t be a major issue for most guitarists. If you tune your 6-string guitar to E flat, the M2 down setting will give instant access to C# drop tuning while the m2 up setting will let you transpose your guitar up a half-step back to E standard. As pitch shifting typically sounds most natural (i.e. like a guitar) at subtle settings, these settings are great for slight retuning for a few particular songs every now and then. The extended pitch shifted tunings (P4-m7) also sound surprisingly good compared to what I’ve heard from various pitch shifting effects pedals in the past. You can drop tune your guitar for baritone tunings that sound great with clean chords, likewise for transposing to achieve higher tunings similar to using a capo. The sounds are quite good all around. Palm muting drop tuned chords with distortion starts to sound a bit more artificial as you go lower and lower in pitch, but there are still some great results to be found, especially with single note riffing. As you raise the pitch of your guitar the sound becomes more “chimy” as you go up with a cool crystalline sound that is still musical. The Dual settings are the Pitch Fork’s ace up the sleeve, giving you access to 2 different harmonies at each of the Shift knob’s settings. These may be blended with your dry signal for 3 part harmonies, and yes, you can still play chords with flawless tracking. Each of these settings has the original up position harmony plus an additional pre-chosen harmony that is useful with it. Particularly worth noting is that the 1 Oct setting in Dual mode gives you +1 Octave and -1 Octave simultaneously. When blended with your dry signal, you can essentially achieve sounds similar to EHX’s Micro POG (without individual level control of the 2 octave voices when used simultaneously, of course). If you’re considering a Micro POG, I’d highly recommend taking a look at the Pitch Fork as it offers even more value at a lower cost and consumes less pedalboard space. The Latch button lets you select between Latch mode and Momentary mode for activating/bypassing the Pitch Fork. In Latch mode you can activate the effect and shift the pitch via an expression pedal or CV control. You can use it in Latch mode as an octave pedal (similar to the Micro POG!) or 3-part harmonizer without the need for an expression pedal, saving more precious pedalboard space. Some guitarists will really appreciate that Electro Harmonix added the Momentary mode similar to the EHX Superego. This allows you to use the Pitch Fork instantly when pressing the foot-switch, immediately bypassing the effect when you lift your foot. An expression pedal controls the rate at which the glissando occurs, shifting instantly (4mS) in heel position or gradually (2 seconds) at the toe position. Try setting the pedal to a fully wet +3 octave setting with an expression pedal in the toe position while using Momentary mode and press and release the foot-switch to send the pitch cascading up and down towards the full +3 octaves for some sci-fi insanity. Also, if you want to use the Momentary mode for instant pitch stuttering effects without an expression pedal plugged in and prefer an ultra fast 4mS to the default 60mS setting, try plugging in a spare ¼” headphone adapter. This lets you save pedalboard space while still getting the instant pitch stuttering sounds of Momentary mode when using an expression pedal set to heel position. The Pitch Fork surpasses what I would have expected. The only things I can even think of adding to this little pedal would be perhaps having a full 12-position rotary dial that adds the m3 (minor 3rd) interval for drop tuning from E standard to C# and perhaps a micro knob for balancing the levels of the both wet signals in Dual mode (adding more Micro POG functionality). But not having these things wouldn’t cause me to pass by this pedal. It’s really incredible how good the Pitch Fork sounds and how well it tracks. I will add that there is sometimes a slight increase in the noise floor when activating the pedal on clean settings, but again, this is hardly a deal-breaker, especially considering that the Pitch Fork will probably mostly be used by guitarists for distorted “whammy” leads. Sure, it seems like there’s always a slightly inorganic quality when pitch shifting a guitar up a full octave (which is arguably a good thing as some guitarists appreciate the slightly synthetic weirdness), but Electro Harmonix are really producing impeccable quality pitch shifting algorithms and pushing past what most companies are doing in terms of quality pitch shifting effects in a standalone stompbox guitar pedals. EHX has been releasing some killer guitar synth pedals lately, and it looks like they’re also aiming to dominate the octave/pitch-shifting/harmonizer market as well. 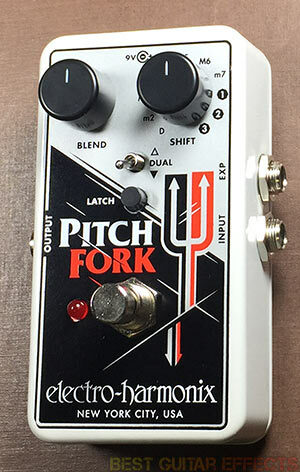 I’m predicting that the Pitch Fork will become EHX’s next big hit in this effect category. The EHX Pitch Fork rocks and is easily one of the best pitch shifting pedals available. The Electro Harmonix Pitch Fork is one of the best pitch shifting pedals available and certainly the best value on the market considering its price. Make no mistake, the Pitch Fork does not skimp on sound quality and is packed with features. It’s the result of EHX’s years of experience creating high quality pitch shifting and octave pedals. That they’ve managed to pack so many options into such a small pedal at a price any guitarist can afford makes the Pitch Fork even more essential. Before you buy another drop tuning or pitch transposing pedal or even if you haven’t considered one in the past, try the Pitch Fork. You can’t go wrong with its plethora of high quality pitch shifting effects at its value packed price. That concludes our Electro Harmonix Pitch Fork review. Thanks for reading. 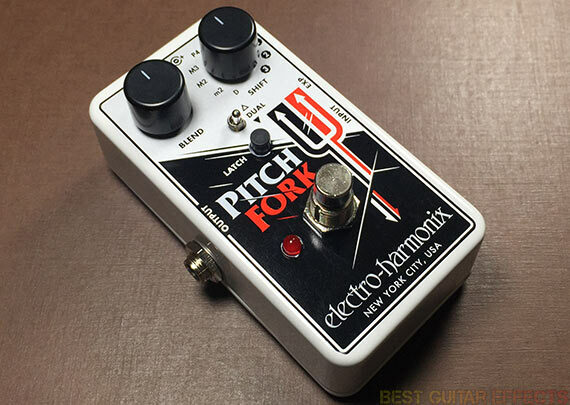 Want to buy the Electro Harmonix Pitch Fork? I have been having much success playing basslines with my Les Paul by taking off the slinkys and putting on fat strings & dropping to the lowest possible octave on the Pitchfork. My Fender PJ bass is getting cobwebs from lack of use! It really is amazing…. Sounds much better then the EHX Micro POG, and a lot more versatile, I have both and I see no need for the mPOG anymore. The only fault I found with the PF is that my “shift” rotary dial’s line indicator is offset from the label’s so that it is hard to tell which function is chosen. Watched the demo vid: Just amazing!. i love this thing. Yes it has its own EHX sound to it but i run the unit in front of a lot of other mutilating boxes so its fine. I prefer it to the equally sized digitech richochet which is so noisy! even when idle and far less intuitive. The “whammy” or momentary function has a good ramp to it and the pitch choices are wide. The one thing I dont like is the Detune function which I personally feel has too much shift on it. This thing sounds terrible! It’s extremely metallic and artificial sounding, especially on bass. It adds gain when you engage it. I bought this over the weekend. It’s going back tonight. Another admirable attribute of the EHPF is that it will accurately track the low B string of a five-string bass. Fun stuff. I was wondering how you would compare this vs the Slammi pedal. Thanks!